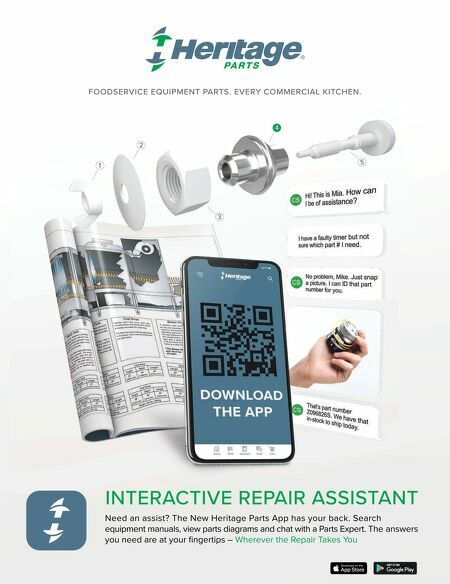 44 • SPONSORED CONTENT • OCTOBER 2018 Today's technology is rapidly evolving, bringing tools to the foodservice industry that raise the bar when it comes to not only repair issues, but also service overall. New programs have made identifying the appropriate parts for foodservice equipment easier, more efficient and accurate, as well. Heritage Parts has unveiled its newest technology— My Equipment 360, Online Quotes and a mobile app to better streamline the parts ordering process. My Equipment 360 allows customers to log all of their equipment on a secure web portal. Their account includes information on the specifics of each piece of equipment, such as the manufacturer, model and serial number as well as the exact location of the equipment. The system creates service part manuals and any other reference ma- terial associated with each unit's parts. This keeps track of the critical information providing equipment down to the serial number, providing operators with service and main- tenance records. This takes the impetus off of the operator and staff members and ensures accurate documentation is being kept. With Heritage Parts' Online Quotes the purchasing process is expedited with an online system that includes a portal for customers to create a quote for their purchas- ing department's approval. This is especially efficient for school districts or large chains that take care of numer- ous locations and need a quote from a parts provider for purchasing approval. Because many working in the foodservice industry are not sitting at their desk with access to a computer, but rather are in a kitchen, dining room or out in the field, Heritage Parts developed an app that provides customers with easy access 24/7 on their smart phone or tablet. The recently released mobile app was a year-long project that included three months of research in conjunc- tion with key customers who provided valuable feedback. Prior to the app's development, someone purchasing a part for foodservice equipment would go online and try to identify what was needed, attempt to pull the manual and research all the particulars themselves. Heritage Parts' new free app has automated the process and made the necessary tools immediately available to cus- tomers. Users download the app on their iPhone or Android by searching for 'Heritage Parts'. They then create an ac- count and simply log in to connect. It works via a smartphone or tablet and allows operators to easily upload manuals and other information to refer to when searching for the neces- sary part, even when not connected to the internet. Customers now have easy and immediate access to information using these online tools and also can contact Heritage Parts' customer service department by phone for access to parts experts to confirm their selection is cor- rect, in stock and can be delivered when needed. This updated technology enhances the efficiency of repairs and the accuracy of the part identification process, providing a more seamless repair process. Most impor- tantly, these programs can significantly curtail equipment downtime, ensuring minimal disruptions to your operation. Technology Enhances Service & Efficiencies Heritage Parts' new technology streamlines the parts ordering process. Operators can easily upload manuals and other information to refer to when searching for the necessary part.